Any condition, any color. Preferably with at least a couple of intact or mostly intact turrets. I saw one of these (in good condition) at the show, but was shocked into putting it back down (and very gingerly so) once I saw the price sticker. So I'll accept even a badly hurt one, until something better comes along. The poor injured thing would still have a long, useful life among its window buddies, that's for sure. 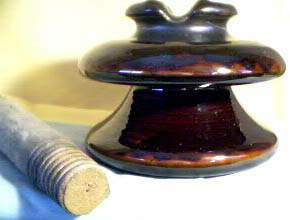 A Lapp M-2942 porcelain power insulator. Any displayable condition, even if it's whacked pretty well. 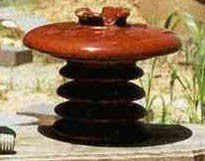 A M-2795 power insulator. The top is porcelain, the bottom is aqua glass. Any condition, incl. specimen. 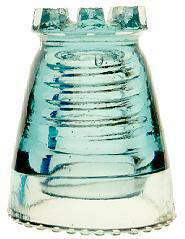 Any threadless insulator (CD700 and above) in any color or condition, including specimen. 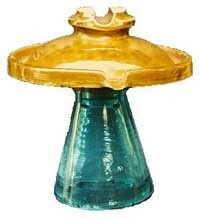 Any insulator in peacock blue, in any condition, including specimen. Any insulator in cornflower blue, honey amber, 7-Up green, or purple; in fair condition or better. Glass (not porcelain) "attic", spool, or feedthrough insulators. See New Arrivals From Before 2002 for examples of these. Pyrex high voltage types (CDs 320 through 340). I was in the hospital for 3 months after brain surgery, so I can't afford any of these insulators anymore. Picture of the M-2942 (on the left) courtesy of Pat Scott. Picture of M-2795 (on the right) from insulators.info. Here's a porcelain beauty like one I used to have in Alaska. It is smaller than most multiparts of this style, and has a radio-treated top. For the immediate future, condition is less important than color - I'll pretty much give any fortunate insulator a good home as long as it can stand upright somehow. Once I've gotten a little sparkle and size to my collection, I'll start working on that condition thing. If you have unwanted insulators that might otherwise end up in the garbage, maybe one the cat nocked over and broke, think about giving it a new home instead of throwing it (or the pieces) away....thanks!